Silver Bullion is a time-honored way to invest in silver and other precious metals. Unlike coins, bullion rounds and bars are not minted by national mints. Instead, they’re created by private companies. While this means that they lack government backing and are not legal tender, they are valued for their purity of silver, as well as the fact that the price is tied very closely to the spot price of silver, with no sentiment. Silverbugs Silver Bars make excellent investment options for many investors, especially if you are looking for a one-ounce purchase that is not a round. 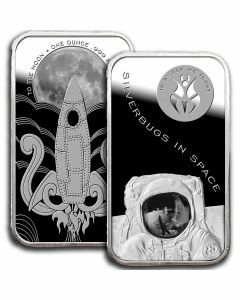 Currently, we offer the Silverbugs In Space bar, which includes a full troy ounce of silver. The front of the bar features a detailed engraving of an astronaut standing on the surface of the moon. Note the amazing reflection depicted on the astronaut’s visor. Above, you will find the Silverbugs logo, as well as the words Silverbugs in Space. On the back of the bar, you will find a stylized design of a rocket ship launching toward the moon. Around the moon are the words To The Moon * One Ounce .999 Fine Silver. This bar is of proof quality, meaning it has a mirror finish so you can more fully enjoy the amazing design. Note that this bar is a limited production run, and is minted in Rochester, New York. If bars are not your preferred investment option, we invite you take a look at our full range of Silverbugs rounds, as well as our selection of mint condition government-issued coins like the American Silver Eagle, the Canadian Maple Leaf, the Chinese Panda, the Australian Kangaroo, the Austrian Philharmonic and more. We pride ourselves on ensuring that each investor is able to find the ideal addition to his or her portfolio.